With the ending of Sarawak Legislative Assembly election, many political commentators predict the date of the dissolution of parliament. 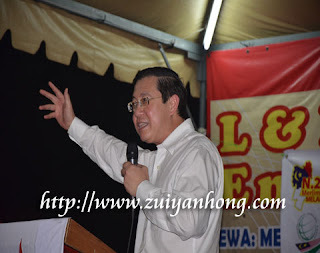 Chief Minister of Penang Lim Guan Eng thinks that the 13th general election wouldn't be held any time soon. The outcome of 10th Sarawak state election deters Prime Minister to dissolve the parliament in advance. Although Pakatan Rakyat failed to deny two-thirds majority of Barisan Nasional but their achievement was pretty better than 2006. They obtain 45% of popular votes as compared with 37% in 2006. Their seats had increased from 7 to 15. All these historic changes indicate that the people of Sarawak are gradually accept the idea of alternative government. When DAP captured 6 seats in Sarawak election in 2006, Pakatan Rakyat made a stunning record in 2008. Now DAP has 15 seats in hand, may be this is a presage of changing government in the coming 13th general election. If not, Barisan Nasional may lose half of its kingdom.